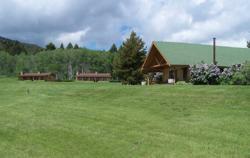 Grassy Mountain Lodge & Cabins has 4 log cabins with 3 separate rooms per cabin. Rooms are similar to motel rooms with a bed, desk, dresser, coffee machine, walk in closet, fireplace and propane heat. A total of 12 rooms. Choose from a room with a queen bed, 2 singles or a full and single. Door opens between 2 rooms if necessary for family. Small meeting room and big living rooms in lodge. Each room is $58.85, whether 1 person or 3. Acres of yard for children to run in. Swings and sandbox and BBQ area. Restaurant on the grounds. Executive Chef, Chuck Schommer and family, serve up comforting Montana cuisine. Dining room open to the public. Please call ahead as restaurant hours are seasonal. Catering is available to any size group. We are a low key, quiet and restful facility for people who enjoy peace and quiet and entertain themselves. Lots of books in the library. Guided trips by truck or 4 wheeler to top of Grassy Mountain and we are 20 minutes from the Hot Springs. We also lease out the whole ranch for weddings. The lodge, grounds, 12 rooms in 4 cabins - all rents for $1200 for the day. For $300 additional, we furnish a horse and carriage to deliver the bride to the wedding spot and bride and groom to the reception. The reception area holds 100 guests. Also fun for anniversaries and family reunions. Directions: Grassy Mountain Lodge & Cabins is half way between Townsend and White Sulphur Springs. We are 1 mile off Highway 12 in Central Montana. From Helena, go south on Highway 287/12 to Townsend, turn east onto Highway 12 toward White Sulphur Springs. At mile marker 23, follow Grassy Mountain Road to our lodge, restaurant and cabins. From White Sulphur Springs, go south on 89/12 and stay on 12 toward Townsend. At the top of the hill, turn left onto Grassy Mountain Road, 1 mile.